Bigger means better when it comes to email lists, right? It makes intuitive sense that the more email addresses you have on a contact list, the greater the reach of your messaging. After all, more email recipients means more opens, clicks and conversions. In this case, however, conventional wisdom is wrong. In fact, the opposite is often true. While there’s certainly a place for widely distributed, generalized email content (such as newsletters), your readers often perk up at the specific information they can use. When they receive an email that looks like it contains something relevant to them in particular, they’re more likely to open it, read it and take the action you want them to. Determine which groups of customers receive certain emails by segmenting your contact list into multiple smaller lists. These smaller contact lists can be based on various factors including geography, demographics (age, gender, etc. ), purchase history and so on. Once you’ve created these segments, you can begin sending targeted emails designed to prompt action. When an email lands in their inbox and it looks relevant and interesting, a reader takes notice. 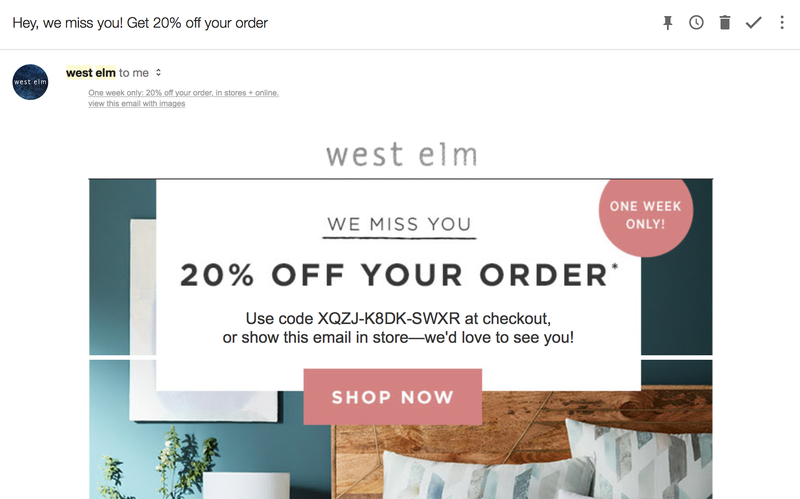 Furniture and home decor retailer west elm boosts their email marketing program’s engagement by keeping track of when customers have most recently shopped with them. When a customer goes “missing” for a while, west elm sends a message taking note of the absence and offering a discount to woo them back. Instead of simply blasting out a discount to their entire list, west elm strategically targets only those readers who’ve been disengaged for a while and attempts to entice them back with something relevant to them: in this case, a personalized discount. If you have the ability to track your customers’ most recent purchases or interactions with your business, you can segment your contacts this way too. 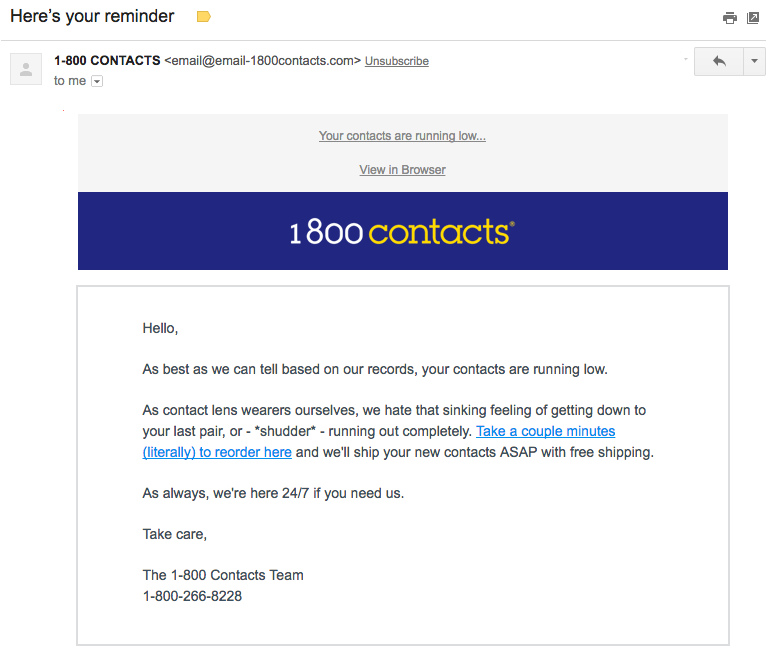 1800Contacts elevates their customers’ engagement with a similar segmentation tactic. By keeping track of what customers order and when, they can automatically send reminder emails. These reminders are relevant – the reader only receives reminders when they should be running low on their previous contact lens order — and the online retailer makes it easy for the customer to replenish their supply without a lot of extra steps. Even nonprofits can take advantage of email segmentation. 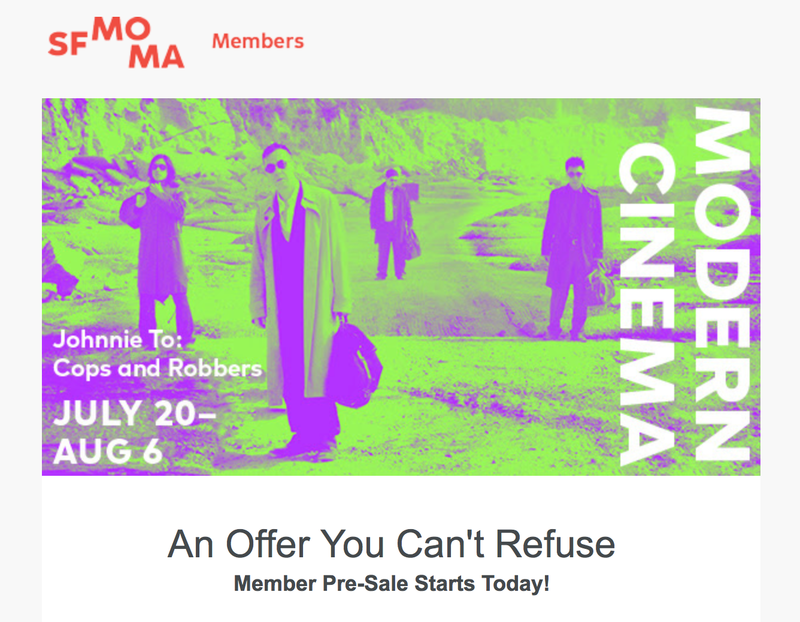 The goal of any museum is to boost ticket sales generally, but the San Francisco Museum of Modern Art (SFMOMA) uses list management to segment its contacts into members and non-members. They send email newsletters and exhibition announcements to non-members, of course. For members, however, the museum appeals to a sense of exclusivity by prompting members to take advantage of special pre-sales, among other benefits. The more you know about your customers and their habits, the better you can segment them into groups based on characteristics or behaviors. That makes your emails more relevant to your audience, which in turn makes them more likely to open, click and purchase. Start segmenting today. Get expert tips and email inspiration biweekly. Subscribe today and download our FREE Guide to Email List Management eBook. Editor’s Note: This blog post was originally published in January 2013 and has been revamped and updated for accuracy and relevance. © 2017 – 2018, Contributing Author. All rights reserved.